Surfing or Botox.... What Really Keep You Looking Young? Swell Alumni Wendy with 60+ years rocking it in Nicaragua! Forget about Botox and face lifts! The best way to appear youthful is to feel youthful. Pack up your lethargy, fatigue and weariness. Put them in the suitcase with your bikini and sunscreen. When your surfing vacation is over, the bikini will probably be faded. You, however, will be looking and feeling years younger. Your fatigue will be a thing of the past. You will have a spring in your step and a zest for life that you had thought long gone. Pack away those “old lady” hobbies. Unearth your bikini, sunscreen and surf wax. Join a sporting craze that unites everyone of all age groups, from tiny children to the elderly. There is nothing more aging than a woman with the weight of the world on her shoulders. The sport of surfing will have you energized and looking and feeling more youthful in no time. Feel your responsibilities and burdens start to slide away after the invigorating surfing sessions in the glorious ocean. There can be nothing more rejuvenating than splashing around in the crystal water waiting for that next wave. The feeling of successfully riding down the face of the wave is just the best in the world. Every surfer comes out of the water after a session with a big grin on her face. Your endorphins (those feel good hormones produced by exercise) will be pumping. The extra exercise will have the blood pumping around your body, resulting in a beautiful healthy glow to your skin. Allow your true beauty to shine from within. Those endorphins will take years off your face. A truly happy and contented woman has a much more youthful appearance. Just look around your own friends and colleagues to see living evidence of this. Enjoying time in the great outdoors is a fine way to stay young at heart. However, while out there surfing it is important to remember to apply your sunscreen. Organic ones are best as they contain less harmful chemicals, and often have added natural moisturizers in them. Two of our favorites are COOLA Sun care and Raw Elements. Ginny learns to surf on Maui. Can you believe she is in her mid-40″s? Another great piece of advice to halt the aging process is to indulge in your surfing in the less damaging times of the sun. Have you heard the phrase “10-3, beneath a tree”? Use the middle of the day for resting, shopping and massages. Smart women surfer’s hit the waves first thing in the morning, before the wind comes up, and in the late afternoon. The late afternoon surfing session can be a great way to banish the frustrations of the day. Catching a little sun through the sunscreen is an excellent way to help halt the process of osteoporosis. Osteoporosis is a nasty part of aging for all females involving the loss of the calcium in the bones, resulting in more fragile bones. “Dowager’s humps” are an excellent example of osteoporosis in its more dramatic form. The calcium that you consume during the day actually needs the Vitamin D from the sun to be metabolized into a substance your body can utilize. Another great reason to start surfing and turn back the hands of time. The physical activity of the surfing will have your upper arms toned in no time. Your whole body will be more supple and youthful looking. Use muscles that have been almost forgotten. Surfing is a great form of exercise for burning off any excess pounds. Which would you rather, the sweaty Stairmaster and the arm weights, or a glorious session in the crystal water with the waves? There is nothing quite like the fresh ocean air to dispel all sad and negative thoughts. It is actually extremely difficult to remain depressed when on the beach. In fact, many people claim that the seaside is a cheaper and more effective alternative to therapy. 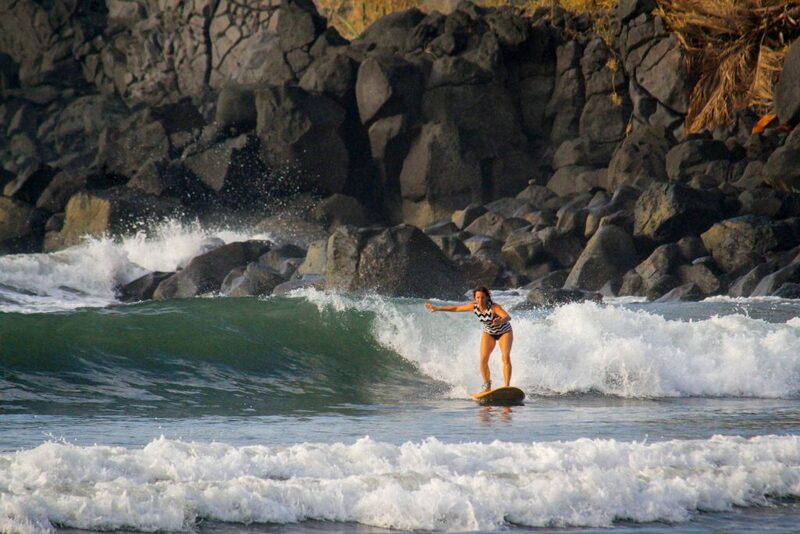 Why go on a plastic surgery holiday when you can go on a women surfer’s holiday instead. Learn, or perfect, a new sport and come home looking and feeling years younger. Return home from your vacation with extra life experience in your soul, not as a blank canvas with all life erased. Your job, your partner, your children and the housework will all appreciate you coming home reinvigorated. The answer to a more youthful appearance is obvious. Say “No” to scalpels and scars and say “Yes” to sunscreen, waves and surfboards. Sunscreen, a bikini, a surfboard. Answer the call. Feel younger. Look younger. Surfing. The natural and healthy way to take 10 years off your face. Remember, “You are only as old as you feel”. Want more specifics? Check out our sister article, Five Ways Surfing Keeps You Young. Lauren learns to rip in her 50’s and now is addicted!